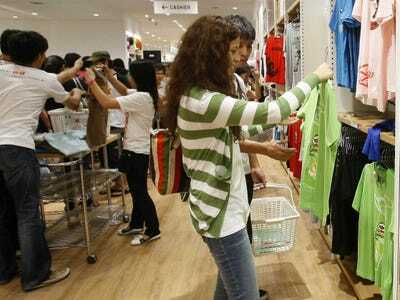 AP Photo/Bullit MarquezUniqlo is among the top-selling brands during this year’s Alibaba Singles Day event. Every year Alibaba makes November 11 a huge event on the retail calendar by holding the world’s largest 24-hour online sale. The event takes place on the Chinese “Singles’ Day” (the 11/11 date was chosen specifically because the 1s represent the “singles”) holiday where people throw parties to meet new friends and potentially new partners. Since 2009, Alibaba has made the day its own with a deep-discounting flash sale, turning it into a landmark shopping bonanza that surpasses huge US shopping events like Black Friday, Cyber Monday and Thanksgiving Day in terms of online sales. billion (49.5 billion RMB), as the Singles’ Day shopping event went multinational for the first time. That means, 21 hours into the event, Alibaba was selling goods at a rate of $US404 million an hour. Earlier in the day Alibaba gave us some insights via its online news centre on the top-selling brands based on gross merchandise volume (GMV) — and they are not all Chinese, like you might expect. 1) Xiaomi — the Chinese smartphone juggernaut that is on pace to report $US1 billion in profits this year. 5) Linshimuye — the Chinese furniture retailer. During a press conference held at Alibaba’s headquarters Tuesday (November 11) the president of Alibaba-owned Tmall.com, its business-to-consumer shopping website, also remarked that German sportswear retailer Adidas and Spanish clothing retailer Massimo Dutty were also “posting good numbers” just over halfway into the festival. More than $US2 billion-worth of goods were sold in the first hour of the Singles Day shopping bonanza today.